There is 2.5 Gigabytes worth of material here (2Gb for the .zip file). If a lot of people try to download them at once, they might use up all the bandwidth – so if you get an error try one of the mirrors. The files are not in three parts. You only have to download one .zip file, which contains everything. Please check that you have enough space on your hard drive before you begin a download. Advertisements in issues 70, 82 and 86 recruit staff for a new venture – a drub rehabilitation programme called Narconon. Today, this organisation is under investigation by an Oklahoma Grand Jury. Issue 86 contains a mysterious warning (and possibly an example of Hubbard striking out against perceived ‘enemies’. 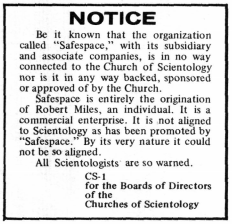 According to this forum post “Safespace” may have been the title of a film that was to be made in the early 1970s by the Church of Scientology (likely from a script by Hubbard). “The story was about a group of people who had a means of taking people to a place of safety in exchange for all their worldly possessions and eternal servitude”. This is only one of many opportunities for original research. Finally, here’s news from Issue 157 which was released in March 1979 – “Super Power will soon be released”. SUPER POWER A Super fantastic but confidential series of rundowns that can be done on anyone whether Dianetic Clear or not that puts the person into fantastic shape unleashing the super power of a Thetan. The Church of Scientology has been as good as it’s word – the Super Power Building, custom designed to provide this ‘rundown’ opened in November 2013 – only 34 years late. Reading these publications I was impressed at how little things have changed. All of the doctrines and practices of Scientology are there, complete with it’s front groups and hostility to criticism. 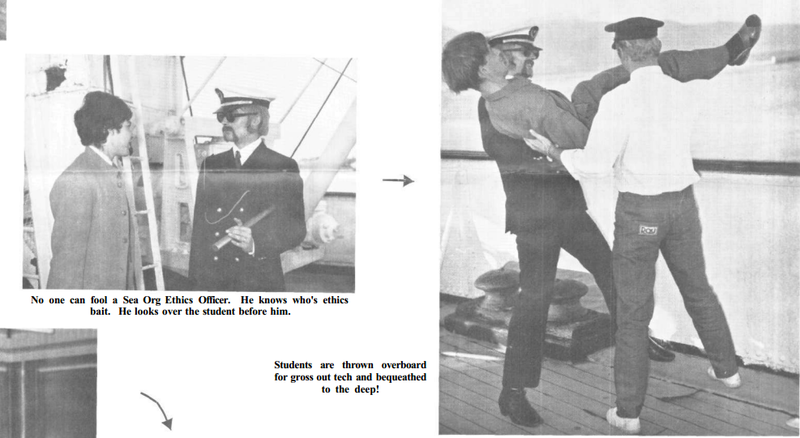 The only parts which look a little strange today are the photographs in the issues that were released when Scientology made its transition from ‘scientific therapy’ to ‘religion’, and staff members were shown sporting clerical collars and dress for a number of issues. If you do any research on this material, or it provokes any memories, or you notice anything interesting, please comment below (with a reference to the file/issue/page if possible) or contact me via the feedback page.